Learn about UMB Bank’s involvement with the Colorado Business Hall of Fame, Junior Achievement – Rocky Mountain and the Denver Metro Chamber of Commerce through the lens of Jon Robinson, who has been involved with the organizations for nearly 20 years. I’ve always believed a little education goes a long way. Whether it’s teaching kids about financial literacy or helping clients identify the best financial services for their business, education has been at the core of it all. Nearly 20 years ago, my desire to teach others led me to Junior Achievement – Rocky Mountain‡. I started working with the organization to help kids learn about money, broaden their horizons and help them realize their full potential. This journey took me into classrooms to talk with young people about checking accounts and budgeting. It allowed me to work with kids to help them graduate high school and make their way into college or the job market. It also led me to become involved with one of my favorite community events — the Colorado Business Hall of Fame‡. Presented by Junior Achievement – Rocky Mountain and the Denver Metro Chamber of Commerce‡, the Colorado Business Hall of Fame is an annual event that recognizes the state’s most respected leaders for their commitment to and investment in the community. When we looked at UMB’s involvement with both the Chamber and Junior Achievement, it only made sense for us to be involved with the Colorado Business Hall of Fame — and UMB has been the presenting sponsor of the event for more than 15 years now. 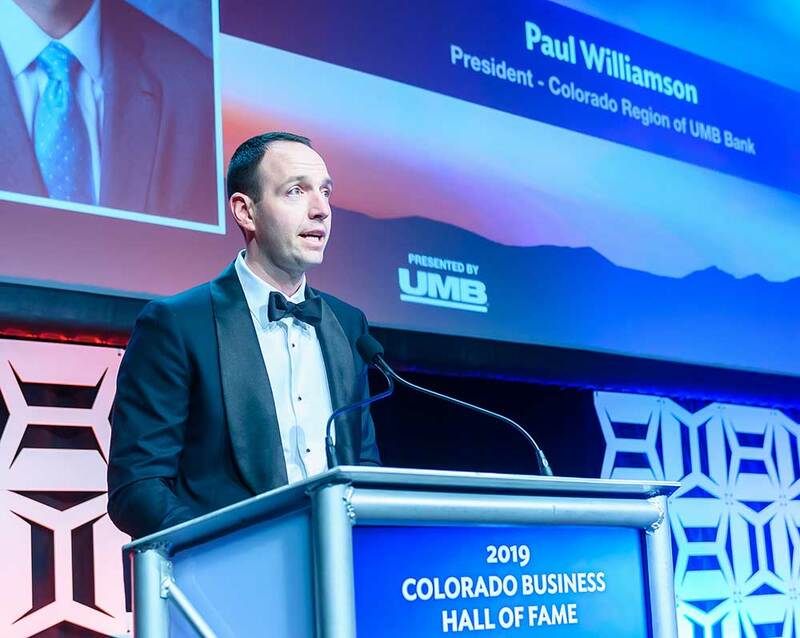 UMB was proud to sponsor the 2019 Colorado Business Hall of Fame event and Paul Williamson, president UMB Bank – Colorado had the chance to help recognize numerous leaders in our community who have given back, in ways both big and small, to Colorado. If you’re interested in who those leaders are and the impact they’ve had, I invite you to read more about them. I love this event because it brings together businesses, community leaders and kids with one goal in mind: to recognize those who have committed their life and career to positively impacting the community. I am a history buff, so the fact that I get to recognize people who have made history here in Colorado is an honor. The truth is that our community, and our state, is better because of these incredible leaders. If you are interested in getting to know these business and civic leaders or if you are interested in giving back, I encourage you to learn more about the Colorado Business Hall of Fame‡, Junior Achievement — Rocky Mountain‡ and the Denver Metro Chamber of Commerce‡. Photos courtesy of InSync Photography. Mr. Robinson is the regional chief credit officer for UMB Bank. He joined UMB in 1981 and has 33 years of experience in the financial services industry.